For many car owners, a manual transmission is the only way to go. A manual offers exceptional reliability, which is one reason many people choose this system over an automatic. Not only are they known for their reliability, there are many people who find vehicles with a clutch more fun to drive. Because a manual transmission allows you to the most control over your vehicle’s shifting, the driving experience is exceptional. If you have a manual transmission, you can expect a long lifetime of reliability. However, as with any major component of your car, a manual transmission will wind up needing repairs at one point or another. 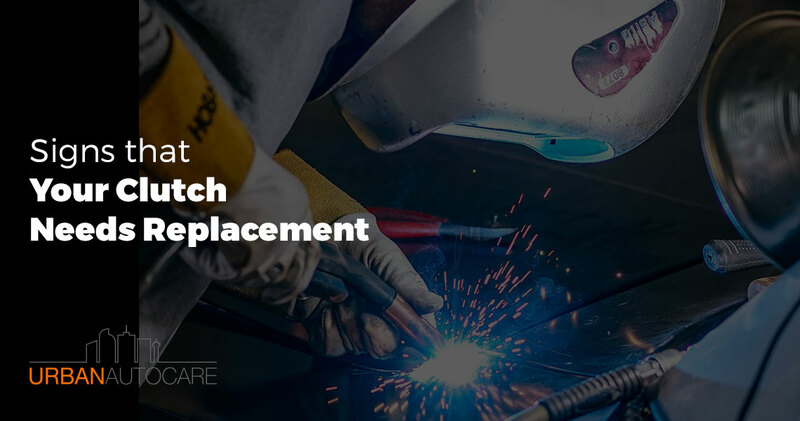 The number one repair you will probably face will be clutch replacement. Here at Urban Auto Care, we have over 50 years of experience working on vehicles and we are well versed in the noticeable signs of clutch failure. Our team provides auto repair in Aurora, Denver and surrounding locations, focused on quality workmanship paired with professional, friendly service. If you are beginning to think your clutch might be on its way out, check out these signs that your clutch is in need of replacement and stop by our shop for help. First, in order to understand when your clutch is failing, you need to understand the basic mechanics of what is going on under the hood. Your clutch plays a very simple role in the operation of your manual transmission. It is responsible for separating the engine from the vehicle’s wheels. This motion ensures that you can change gears while the engine is still running. Each piece of your clutch works together to create the pressure needed to engage and disengage your engine from the wheels. A properly operating clutch will perform these actions smoothly and without any major sound. When your clutch starts to go, you will notice some of the following symptoms. When you engage your clutch, do you hear a squeaking, squealing, or another distinctive sound? This can be a good indication that your clutch is on its way out. A good clutch should be quiet and smooth. Make sure that as soon as you start hearing strange noises from your clutch you take your vehicle in for an inspection by your local mechanic. Your car should be able to shift through all gears smoothly and without any issue. If you are starting to notice that at times your engine revs loudly before your vehicle actually accelerates, it could be a strong indication that something is amiss under the hood. A failing clutch will start to slip, leading to the revving engine with a lack of power. This symptom is particularly noticeable and should be addressed right away. Unless you are inexperienced in driving a manual transmission, shifting should never be a difficult process. You should be able to easily engage your clutch, change gears, and let off the clutch without issue. If you are facing difficulties with shifting, it is a strong indication that your clutch could use some attention. When you push in your clutch, does it feel spongy or sticky? Perhaps it vibrates or shudders in an odd way. Whatever the case, when you start to feel a difference in the way your clutch engages, it might be time for an inspection. Sometimes, the feel of your clutch will slowly change over time, making it less noticeable to you. If you are uncertain whether or not your clutch is feeling a bit amiss, then take it into the shop for a quick inspection. If you are driving a vehicle with a clutch that is beyond 50,000 miles, you might be due for a clutch replacement. The length of your clutch’s life will be hugely dependent upon your vehicle, how it was driven, what maintenance has been performed, and the quality of the original product. Some clutches last for over 100,000 miles, while others fail much earlier on. The best way to ensure your clutch doesn’t fail on you one day as you are driving down the road is to have it inspected any time you start to notice an issue with the way it is operating. If you are hearing any questionable noises from your clutch or you are struggling to shift smoothly, please stop by our shop for a quick diagnosis. Here at Urban Auto Care, we are passionate about providing auto repair to Aurora, Denver, and surrounding areas. Our clients trust us for our honest and straightforward approach to auto repairs. We will never sell you on any service you don’t need, but we will warn you of any troublesome signs we see your vehicle. Stop by today or reach out to learn more.